Drawing 12 appears to be a working drawing for the attic but the watermark dates the drawing to after 1816, well after the Princes Street screen wall was built. 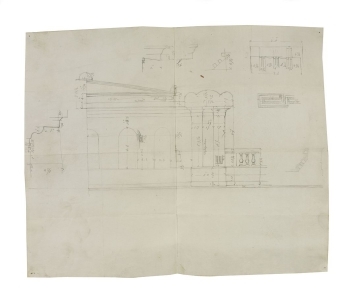 Therefore the drawing could be a survey made for Soane's proposals for the new façades (see scheme 4:2). It shows in detail the built design for the attic: a panel between twin fluted pilasters and surmounted by a pediment with antefixes. The acroteria are outlined.